The Positive Effects of Knitting and Crocheting by Nancy Weshkoff | Moonflower Yoga Inc. Creating a knitted or crocheted piece lowers your heart rate and blood pressure. Heart disease is the number one killer of women in this country, and taking steps to reduce your risk of heart disease is highly recommended. It lowers your stress levels, and has been found to reduce the stress hormone cortisol. It is meditative. Working on your piece helps you to concentrate on the present moment. Being mindful and letting go of regrets from the past or worries about the future is key to good health. It has been found to help people stop smoking by providing a positive outlet. Can help children with math skills, especially when following a challenging instruction. It has been found to help people with cancer and other serious diseases cope with their illness. The pieces that you create are something special for both you and the receiver. What’s better than a gift from the heart handmade with love! At Moonflower Yoga in Bellmore, in Nassau County, Long Island (New York), we have a very fun Moonflower Yoga Needle Arts Group that meets approximately every 4-6 weeks. The members of this group work on their individual pieces. 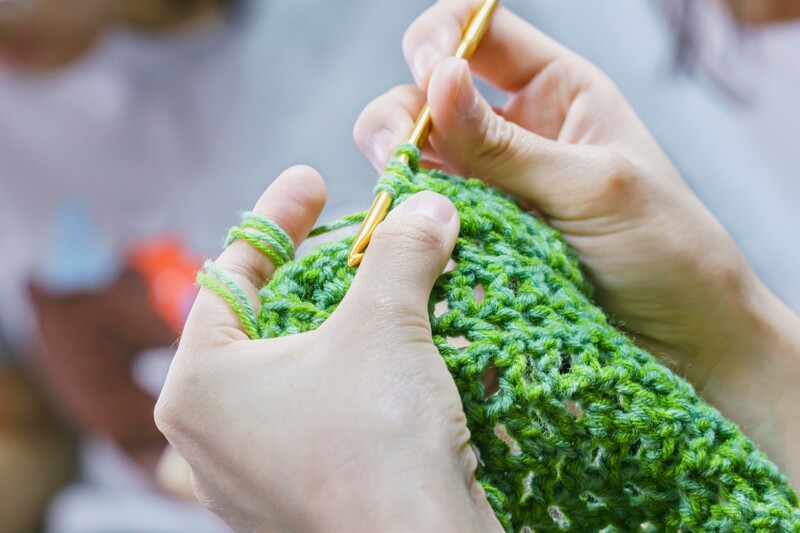 Many do crocheting, while others prefer quilting, needlepoint, or knitting. Whichever handicraft you prefer is fine. Everyone comes together to show their latest creations, to get advice from the group, and have fun catching up with the other members on what has transpired since the last meeting. For newcomers who have never tried doing this before, there are experienced members of the Moonflower Yoga Needle Arts Group who offer free advice on how to do some basic steps. It is a great way to spend an afternoon. And, as stated above, knitting and crocheting offers many other fabulous health benefits. If you are near Bellmore, New York, in Long Island’s Nassau County this Saturday, February 20th, please stop by and join us for the next installment of the Moonflower Yoga Needle Arts Group. You will have a blast working on your own piece, enjoying the company of the fellow Moonflower Yoga Needle Arts Group members, sampling delicious homemade snacks, and, of course, you will do some great things for your health as well. We also have a great variety of yoga classes with great yoga teachers at the Moonflower Yoga studio, as well as fascinating workshops. We look forward to having you join us soon!